Beginner Catfishing Rod, Reel, Rigs, Hooks and Gear for $35. Fishing can be an expensive sport, just ask my wife. But just because some of us go ape crazy and buy every little fishing gadget on the market, doesn’t mean you have to. If you want to take your kid fishing or if you want to get into catfishing it doesn’t have to be expensive. For $35 you can go to your local sporting good store and get a beginner catfishing rod, reel, rigs, hooks and gear. Enough equipment and gear to spend an weekend fishing for catfish. It won’t be fancy but it will be enough to get the job done. The most expensive part of fishing is the rod and reel. Luckily there are some really affordable rod and reel combos on the market. For example, the Shakespeare Alpha Big Water 7′ rod combo is just $29. While this is certainly not the only affordable low end beginner catfishing rod and reel on the market it is a good example and a well known brand name. 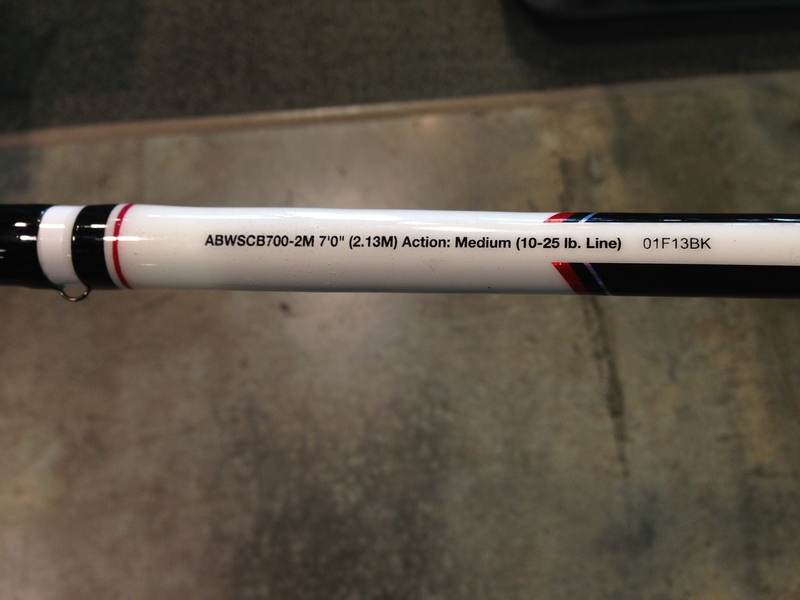 it should be a spinning rod (not a bait casting rod). A beginner catfishing rod should be a medium action rod and have a recommended lure weight of approximately 1/2 to 3 ounces. be less than $35 for the whole rod and reel combo. Once you have picked out a beginner rod and reel combo choose your rigs and hooks. Until you get comfortable tying your own rigs buy them pre-made. Pre-made rigs are super cheap and reliable. My favorite beginner catfishing rig are the hi-low rigs. I am no longer a beginner and I still use high-low rigs a lot. You can buy heavy duty catfishing and surf fishing hi-low rigs or you can buy crappie high-low rigs with the hooks included. 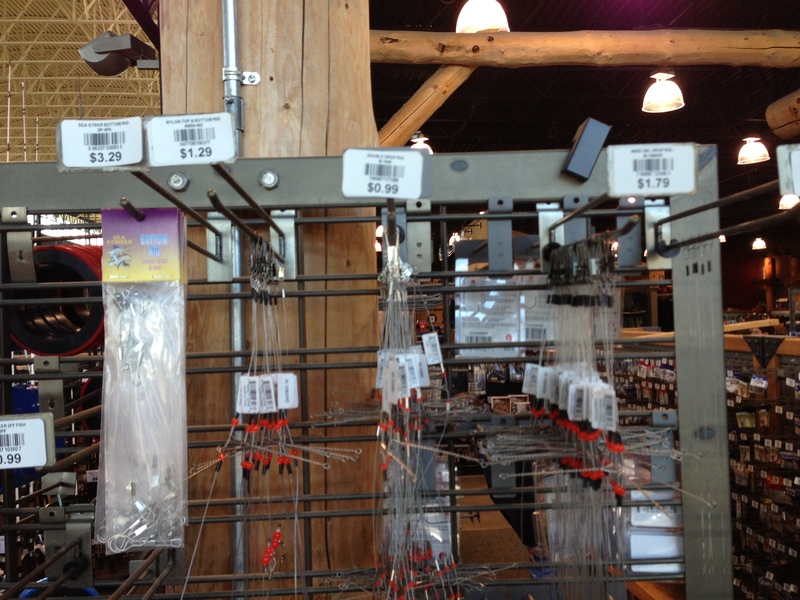 If you buy a high-low rig without the hooks included you can buy pre-tied hooks for about a $1 from any sporting good store. Once you have your hi-low rigs and your pre-tied hooks you just need weights. 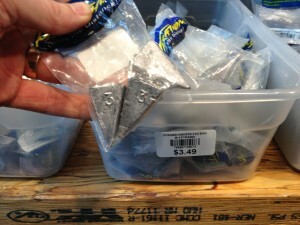 1-3 ounce pyramid sinkers go best with hi-low rigs and they cost about $.30 per ounce of lead. 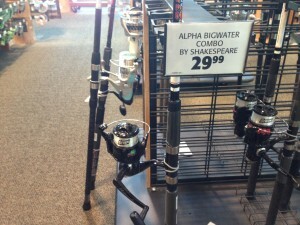 So for $29 you can get a rod and reel with line. For $2.94 you can buy two crappier rigs with hooks. And for $1.20 you can get two 2 ounce pyramid sinkers. That leaves a few bucks for worms or chicken liver and you are ready to fish. For more info on catfish bait check out our website. So for less than $35 you can get a brand new beginner catfishing rod, reel, rigs, hooks and gear. For a video about buying a beginner catfishing rod & reel combo check out our Youtube channel. Pyramid sinkers can be bought for about $.30 per ounce of lead. For $29 you can get a beginner catifhsing rod and reel combo with the line already on the reel. 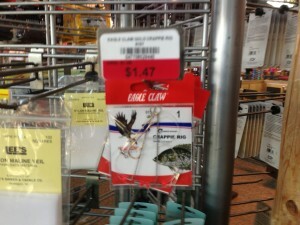 Crappie Hi-low rig for $1.47 includes the hooks. 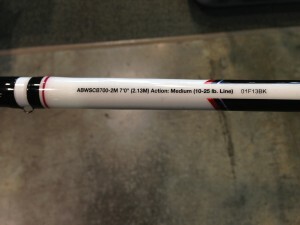 A beginner catfishing rod should be about 6-7′ and 10-20lb line weight.